Over the past ten years proponents of ‘psychology in the real world’ groups have covered a broad spectrum of community-based groups. In 2006 local psychologist Guy Holmes ran a ‘toxic mental environments’ group aiming to expose factors that are detrimental to our wellbeing but that are not usually included in psychology and psychiatry textbooks, e.g. poverty. The 2013 toxic mental environments group aimed to shift its member’s perceptions of their difficulties from individualised distress to consequences of a complex physical and social world; a world that has become ‘toxic’ to our wellbeing. Toxic environments can be understood as physical, sociological and psychological experiences in our daily lives that lead to a sense of ‘dis-ease’ in society. It may also include the means through which that society has attempted to counteract these influences. I refer here to ‘dis-ease’ rather than the more medical usage of the term to underline that at its root disease signifies separation from comfort; the original French word ‘desaise’ breaks down into ‘des’, meaning without or away from and ‘aise’ from the old French word for comfort, pleasure, well-being or opportunity. This meaning can be applied much more broadly than just the medicalised usage of the word today. The group’s philosophy was based on previous work by Sue Holland (Holland, 1992) and later Guy Holmes (Holmes, 2010); the aim was that the group programme be an intervention in itself. The group was hoped to provide dynamic movement within the individual group members from private symptom to public action, i.e. to shift the thinking of attendees from personal responsibility for their distress to a broader understanding of the environmental causes. 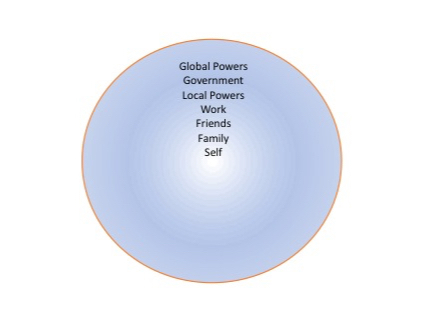 The power horizon diagram (Smail, 2005) seen in Figure one was used throughout the planning and running of the group to draw attention to the proximal and distal influences on our individual lives. The power horizon suggests why there might be a draw to understanding responses to distress in terms of individual change rather than change to the world around us; the power horizon positions aspects of our society and culture that are often removed from the day-to-day lives of the individual as further away in terms of personal contact we have with people who shape and influence these institutions and bodies. For instance, governmental policies such as the so-called ‘bedroom tax’ or ‘spare room supplement’ (have been suggested to lead to greater financial hardships for people with physical disabilities , but the influence those individuals have over this policy is limited and ‘far away’, i.e. only amenable to change through another powerful individual (their local MP) or group. Figure two describes social action therapy adapted for relevance to group work (Holmes, 2010) and shows the stage at which the toxic mental environment group 2013 was aimed. According to this model interventions can be aimed at the individual as a patient, a person, a citizen or an activist. These labels attempt to set down the differences between those interventions aimed at understanding and easing distress on an individual basis and those interventions seeking to understand a person’s experience in terms of the systemic and societal influences up on them. The idea here is that by encouraging a wider view of the factors impacting on the individual’s mental health we might encourage that individual to engage in action to change those wider systemic factors. The aims of the toxic mental environments group 2013 then were two fold; firstly, the group aimed to encourage members to think about changes they could make in their own lives to reduce the impact of the factors mentioned above, and secondly to encourage movement within each group member from a citizen stance, associated with exploration of the social factors impacting on themselves and all others to activist stance, associated with beginning to make changes to the environments/aspects of society that affect themselves and all others (Holmes, 2010). The group format and content were decided upon in an effort to engage the professional, the service user and the interested member of the public alike. The group was evaluated using group member feedback and descriptions of participation from speakers. It was also hoped that a measure of the success of the group would be the degree to which the participants made changes in their lives and developed a stance more in line with the activist stance described earlier. Planning and co-facilitation of the group was conducted by Nicki (a service user consultant) and I (a trainee clinical psychologist supervised by a clinical psychologist). Planning of the group was given priority for months before the group would run. This was because all too often the time and work involved in setting up a group is underestimated. This then leads to rushed planning, ad hoc group sessions and ultimately a poorer service to the group members. The group ran for five sessions on a fortnightly basis. It was open to everyone, advertised in the local community coffee houses, libraries, taxi ranks, public transport areas and community centres as well as mental health and probationary services. The group was limited to 14 members, however although 11 people signed up prior to the first session 16 members attended the first session. Numbers varied throughout the five sessions, but there was a ‘core group’ of 11 members who attended each week. These members included people who would described themselves as service users (people who have experienced mental health services either as an inpatient or outpatient), service providers (professionals working in mental health services), and interested members of the public who did not identify with either of these roles. Three people who represented a mix of these three roles facilitated the groups. Each of the speakers were invited to open discussion on topics relevant to ‘toxic mental environments’ by describing the theoretical basis for them as contributors to distress and then exploring ways in which these problems have been and can be challenged. The general format of the group was suggested to each speaker using a generic template (Appendix One). This format ensured both the theoretical basis of these issues as contributors to mental distress and how these issues are challenged was covered. The aim of this approach was to combine the psychological knowledge of the speakers with the greater experience of planning and facilitating groups of the service-user consultant. An underlying philosophy of the group was to model the types of positive experiences people can benefit from, including consideration of the physical environment, the ‘social contract’ of the group i.e. the need for equality between speakers, facilitators & group members and respect for all attendees perspectives and experiences. The venue was chosen carefully so as to be inclusive of any potential group member wishing to attend and also to model the types of environment that can be more beneficial to a person’s wellbeing, i.e. the venue needed to have disabled access, be unrelated to mental health services, and offer a relatively pleasant atmosphere for learning. The initial session aimed to introduce the concept of a toxic mental environment, and what this might look like. It sought to answer the question ‘could it be that our social experiences contribute to an increasing sense of ‘dis-ease’ in society’? Commentators have pointed to the saturation of our everyday lives by advertising and consumerism as evidence of a social toxic environment; although this saturation may be beneficial to the advertising industry and businesses wishing to sell their products, it may also represent an environment that we as humans are not evolved to cope with. Products are often advertised as having the ability to improve our everyday lives, to make things easier or to somehow increase our social status; however (in western society especially), rates of psychological dis-ease continue to increase (Wilkinson & Pickett, 2009). Advertisements use sophisticated psychological knowledge to entice the population to buy the products they sell. One way advertisements do this is by exploiting a sense of ‘ennui’ or emptiness in people and offering products to ‘fill this emptiness’, advertisements may even try to instil this sense of ennui in people in order to sell their products. Many products do not deliver on their promises of better lifestyles or personal change which some argue has led to a growing sense of dis-ease among many in society. The issues described above and the dis-ease apparent as a consequence has led to an expanding industry of health care workers, therapists, self-help authors and an ever increasing number of pharmacological solutions. Each of the professional groups involved in this new industry have their own perceptions as to what may be causing the dis-ease. This in turn may have led to conflicting ideas about health and ill-health that may be internalised by those in receipt of care. However individual and group therapies can imply that individuals need only to adjust their responses to a neutral or benign world, as opposed to challenging and changing the world they inhabit, in order to restore their sense of wellbeing. It otherwise can be thought of as an individualisation of distress that serves to preserve the status quo and may in fact blame the individual for their distress. Issues of social inequality can create toxic mental environments, however social inequality is a huge subject and a full discussion of its many layers was not possible. This session therefore concentrated on only a few aspects of social inequality, e.g. class inequality. Research suggests that despite being in a period of previously unknown wealth and prosperity in the UK, the benefits of this prosperity have not been equally shared (Wilkinson & Pickett, 2009); as an example of this, according UK government statistics people in social class one live on average almost seven years longer than those in social class five (Moloney, 2013). The argument that this is a necessary evil of progress is disputed by the inequalities’ hypothesis which argues that once a country has eliminated most infectious and occupational diseases, then further improvements in medicine and material infrastructure count for little in terms of wellbeing and health (Wilkinson & Picket, 2009). Instead for most modern industrialised societies, the average health, wellbeing and longevity of the population is dependent on the spread of wealth, and particularly the gap between the richest and the poorest (Wilkinson, 1996). The beginning of the green movement thirty years ago was precipitated by the idea that our physical environments were becoming toxic and making people sick. Conservation groups that had been in existence since the 19th century came together to try to protect the physical environment, both for its own sake and for its beneficial impact on the lives of those who interacted with it. In more modern times research suggests the built environment can have direct and indirect effects on our mental health (Wandersman & Nation, 1998; Weich et al, 2002; Evans, 2003; Guite, Clark & Ackrill, 2006). For instance, high rise housing has been shown to be detrimental to the wellbeing of women with children (Evans, 2003). Poor-quality housing is suggested to increase a person’s experience of distress. Furthermore the mental health of psychiatric patients has been associated with design elements of the inpatient units they occupy; design features affect people’s ability to regulate social interaction e.g., furniture configuration and privacy (Evans, 2003). This principle also relates to people with degenerative diseases such as Alzheimer’s disease, where patients have been found to adjust better to small-scale, homier environments that also have lower levels of stimulation. Alzheimer’s disease patients may also benefit from buildings that accommodate physical wandering, also known as walking (Evans, 2003). Indirectly, the physical environment may influence mental health by altering psychosocial processes with known mental health sequelae: Personal control, socially supportive relationships, and restoration from stress and fatigue are all affected by aspects of the built environment (Evans, 2003). When there is real discrepancy in income and in access to resources other difficult social problems are likely to increase. For instance, realistic conflict theory suggests that when there is competition for limited resources the rates of discrimination will increase (Sheriff, 1966); this is supported by higher rates of prejudice, discrimination and violence during times of economic difficulty (Sheriff, 1966). Social devaluation of minority groups by more powerful groups in a society leads to several of what Wolfensberger called ‘wounds’. These wounds include relegation to low status and low power positions, branding with stigmatising labels, impoverishment of relationships, grouping together with like disempowered groups, impoverishment of material resource and loss of control in decision-making (Holmes, 2010). In a local context, the world health organisation (WHO) state that ‘the sheer lack of respect and understanding given to the disadvantaged in Britain is highly corrosive of wellbeing and all the more so because it is constant and overwhelming’ (Holmes, 2010), this statement speaks of the everyday experiences of countless people in Britain. This process of devaluation of minority groups by powerful others can lead to an internalised sense of worthlessness and impoverishment of self in members of the devalued groups. 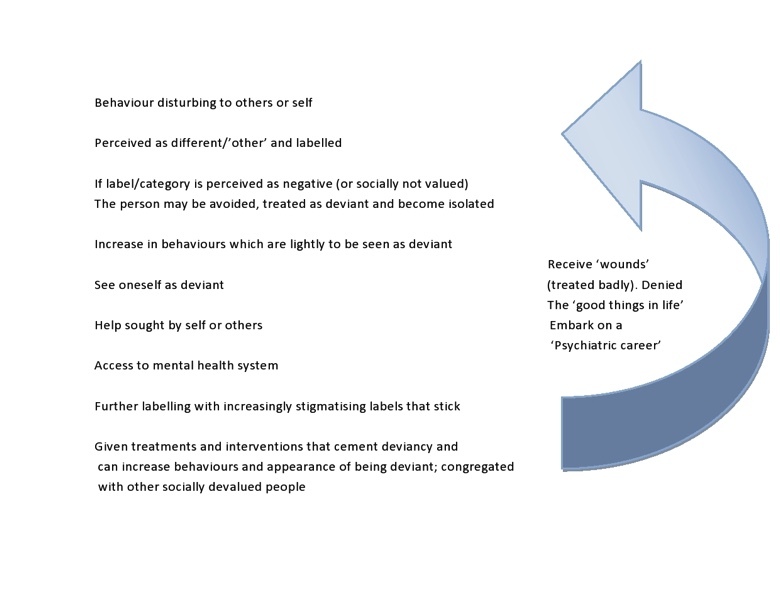 Figure three shows how this ‘stigma cycle’ can lead to increasing isolation, greater psychological distress and greater societal devaluation. The final session was presented as an opportunity to reflect on the content of the previous four sessions, an open session for group members to discuss further action they would like to take, and a means through which to informally evaluate the group as a whole. The session differed from the previous ones in that no speaker was invited (although those who had contributed to the previous sessions were welcome to attend). Instead I organised the session into two halves. In the first half the group reviewed the ‘main themes’ to have been discussed in the previous sessions, and fed back on their experiences of the sessions. In the second half I asked the group members to think about what they planned to take away from the group, whether they wanted to take part in community projects or further support groups and if so to think through some of the likely practicalities involved in taking action. A key image at this stage of the session was the ‘Small is beautiful’ image (reproduced in figure four). 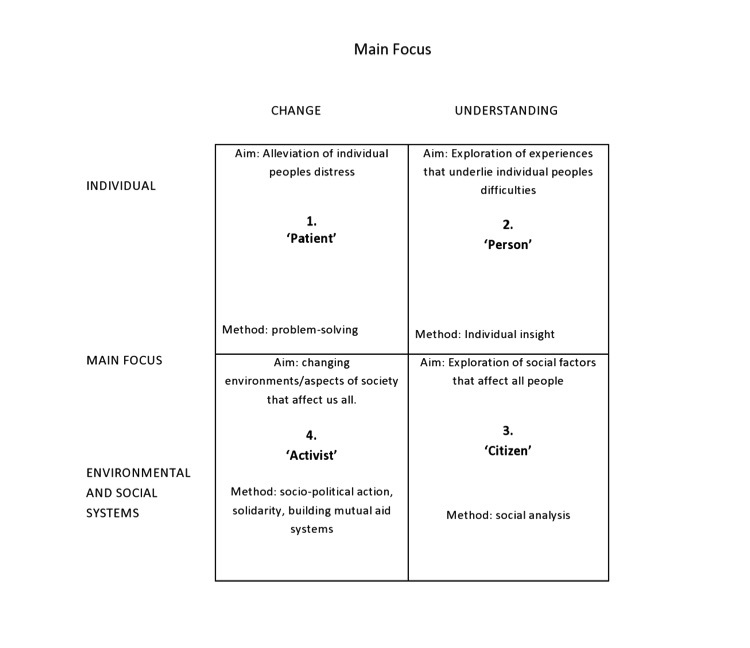 Figure four was used to focus the group members of manageable change within their own lives and own community. One measure of change that is important to consider when evaluating the group is whether the group members achieved a change in stance from ‘citizen’ to ‘activist’. A positive sign that this change has occurred can be seen in the setting up of a mutual support group called ‘changing TMEs’ in the aftermath of the group. Included here is a description of the aims of this group, which is entirely led my interested parties who were initially involved in the TME group. These changes might be changing something about our own lives, in a practical sense or maybe an attitude that is unhelpful, changing something in our local society, or looking to address something in the wider world. The aim of the meetings is to help us to identify things that are having a detrimental effect on our well-being and to support each other in addressing that in some way, rather than feeling defeated or just moaning about the way things are! The monthly group meetings follow the format of having a discussion time so that group members can discuss and clarify what may be causing some 'toxicity' in their personal or wider environment, and then, if appropriate to identify a way to change it, or indeed to live with it more effectively. Goal setting is an important activity to focus on the How of making a change, and to look at the barriers and benefits of change. Discussion - an opportunity for group members to look at something that may be bothering them. This may just be to 'sound-off' so that they can let it go, or to clarify whether it's something that can be changed. Examining change - it is often useful to explore the consequence of making changes before actually embarking on an action. The group can support each other in looking at barriers to change, and the advantages and disadvantages of making a change. Goal setting - If a change is desirable and possible then a SMART (Specific, Measurable, Achievable, Realistic, Time limited) can be created and shared with the group. Support and Feedback - Each meeting is a chance for participants to get support and give feedback about whatever change they are working on. Additionally, individuals can work together between meetings to encourage and support each other using a 'buddy' system where they decide how best to help one another in between the meetings, eg by regular phone calls or emails to feed back on specific tasks within their goals.